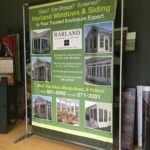 As we’ve grown over the years, “Express Signs” was no longer an adequate reflection of who we are and what we offer as company. Seven Barks Graphics better differentiates us from the crowd of “fast sign” companies and allows us to continue our growth into new areas. Read more about our rebranding. Did you get sold? Has anything changed? No. We still have the same owner, the same dedicated employees, the same convenient location, and the same commitment to quality and service. The only thing that’s changes is our name. We accept most file types with a few caveats. Refer to our file criteria for a detailed list of acceptable files. I need something tomorrow. How fast can you produce my order? The usual turn around time for most in-house produced orders is 3-5 days depending on current workload. If you need an order produced faster than that, we will make every reasonable effort to expedite the order at no charge. However, if meeting the deadline requires us to incur additional costs (labor, shipping, etc. ), those costs will be passed on to the customer. Will you design the sign/graphics for me? Yes. We have a team of talented professionals that can assist you in designing your sign or graphics. Simple layout of text and graphics is usually done at no charge. Moderate to complex design work can be done at an additional charge. Regular business hours are from 8:30am – 5:00pm M-F but there is usually someone here before and after those hours. If you do plan to drop by before or after hours, please call ahead to make sure we know to expect you. We provide a 30% discount off of in-house products provided we received a copy of the organization’s 501(c)(3). Unfortunately, we cannot provide a discount on resale or custom items. What if there is a problem with the finished product? Satisfied customers are very important to us. If there is an issue with the final product, we will do whatever it takes to make it right. In situations where an error, mistake or oversight is visible in a customer approved proof, our policy is that customer accepts responsibility for the error yet is given a discount on the costs of reprinting.